One thing that seems to be a big part of my home decor lately has been these weathered grey tone baskets. They offer both style and storage solutions. But most of all, they give me the texture I need with a neutral color palette. 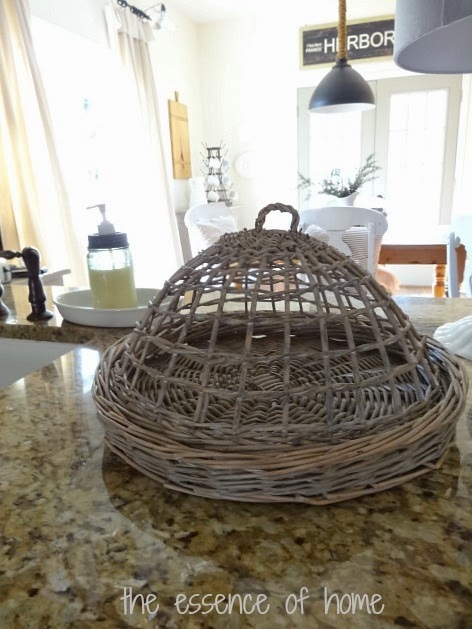 In my kitchen, I have this wicker dome and platter set. It's missing the sheer fabric lining inside the dome, but I like it anyway. This one on my table holds my pitcher with greenery. It's purely decorative, but could be used for just about anything. It was a recent purchase from Ikea. Ikea is a great place to find baskets like this. 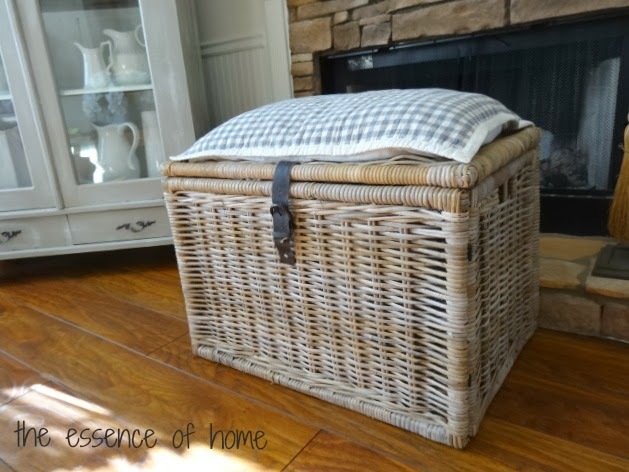 I am using this lined hamper as a side table for my chair in the family room. Inside, it holds throws. The lining helps keep them from getting picked by the wicker. This trunk is another recent purchase from Ikea. I was going to keep my throws in it but it isn't lined. I will store something else in it instead. This tall skinny basket could easily be used to hold umbrellas or walking sticks. It can even be hung on a wall. I'm using it for flowers in my foyer though. This is actually a serving tray or charger, but I'm using it on the wall as art. I painted some roman numerals on it which gave it some personality. This one isn't in the grey tone however. I did the same with this one. It is propped up above my display cabinet in the dining room. And finally, I purchased this basket from Target a few years ago. Wish they still sold them! It's very sturdy and in the perfect shade of weathered grey. I painted numbers on one side, so I can choose which side to use if I want. It holds magazines. So, if you're looking to add texture, storage and style to your home, you might want to consider something like these. But be careful. They can quickly become addictive. Great ideas for using baskets! How could anyone live without them? Baskets HIDE a multitude of stuff around here! They all look great. I probably need more baskets around here. 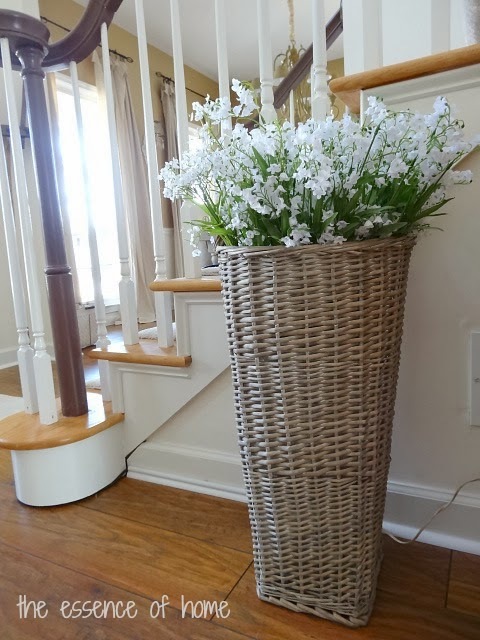 I'm a basket person, and have many around my home, and until I starting seeing yours almost forgot as they are just part of my décor for a long time. One of these days, I'll take some pictures. You give me great ideas for where and how to use them. Love that little Kitchen dome basket. How sweet it that. 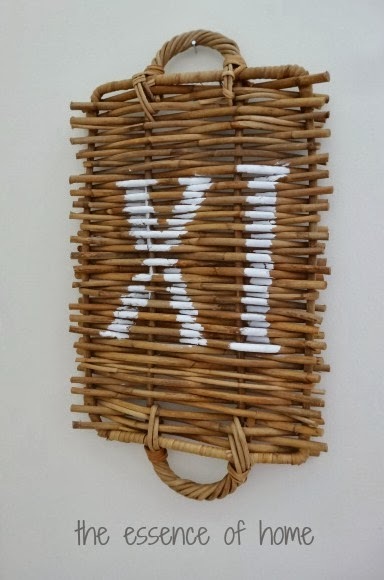 Like the idea for the lined basket for throws. You are such a clever decorator. Love all the baskets! I love them but find that they are usually too expensive in places like target. Maybe I can go thrifting soon and use some of your ideas. Love the number stenciling. I'm pretty addicted to baskets to Kelly...I have that huge trunk from ikea too! I love it and wish I had another one...hopefully next time I go to ikea i'll have room for it in my car. all of yours are so pretty and I like the idea of adding numbers. Love your baskets and your gorgeous home. I really like your style a lot. Love them all and how you have displayed them. Reminds me to get out my basket and add my tulips. oh I love that tall one. where did you get that. Perfect for umbrellas! I was at world market today and they also have a nice selection of baskets. I love your baskets. That tall one is fabulous. I am on the look out for a basket tray for my kitchen counter. 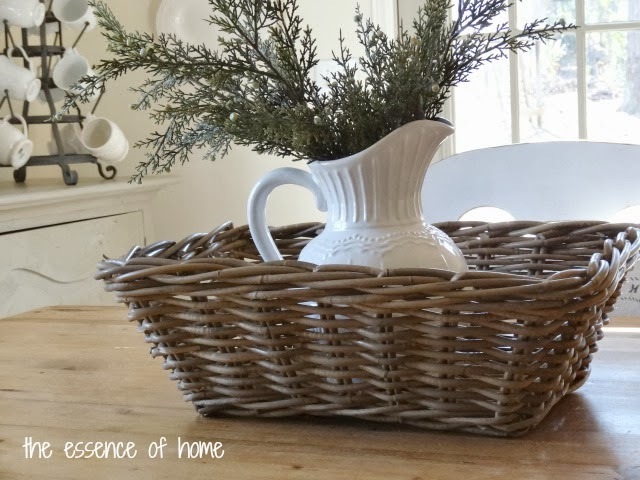 I love the texture and warmth these baskets add to your decor! You have a wonderful collection, Kelly! I love the warmth & texture wicker adds to a room! I have that same dome set only mine is more brown...I love it! Great idea using a hamper to store blankets! I never thought of that. Love all your pretties! I love all your weathered baskets. Right now I am wanting one for my coffee table. I need to make a trip to IKEA! One can never have too many baskets! I've got a few vintage baskets that I've had for years and I never tire of them. I love the big trunk type basket you bought at IKEA. 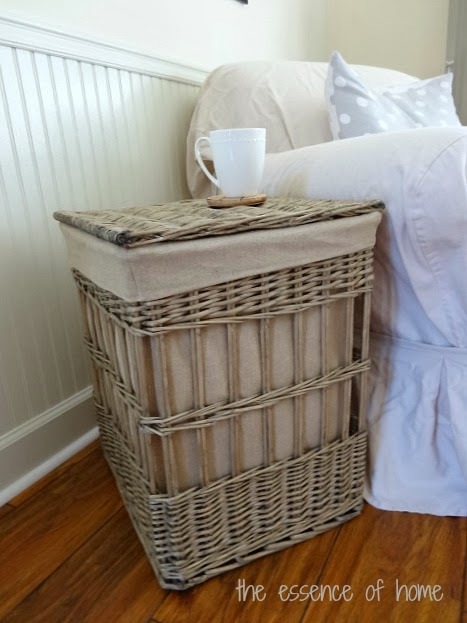 And great idea to store your throws in the hamper basket and use it as a side table! Can't have too many baskets. I love baskets!! Need me some more especially in the nursery. Your have your wonderful touch. All of your baskets are so different and neat...and functional!! I like how you use them and the ones you added to with some paint! Love all your baskets!! I have several small ones that I use, but wishing I had some big ones. Might need to make a trip to Ikea to see what they have...haven't been there in a while. Yours look great. I love the idea of using that lined hamper to store throws -- genius. Did you find that tall skinny one at IKEA, too? I really like that one. I have some big old nesting baskets. They started out a natural color, then a couple years ago I painted them a black color, and I'm fixing to paint them with chalk paint, put a number on them, and fold throws for inside. Wonder where I got that idea? Lovely post. So much help, too. 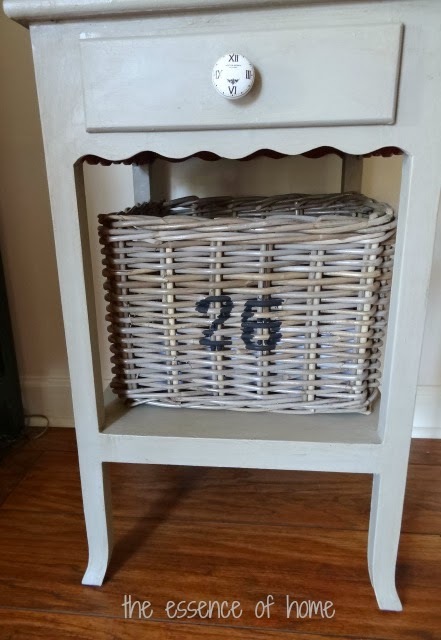 I love the look of your gray baskets...I've "fauxed" some with linen chalk paint wash. Beatuiful! I love all your baskets. I love baskets too. They do give texture and warmth to a space. I love all the creative things you have done with yours. Just beautiful. Love all your baskets, what a collection. That tall one is my favorite. I would love to get my hands on one of them for the new house. I am following you on Facebook now. I really like the one with flowers in your foyer and the big hampers. I need to go to Ikea..well, maybe not. 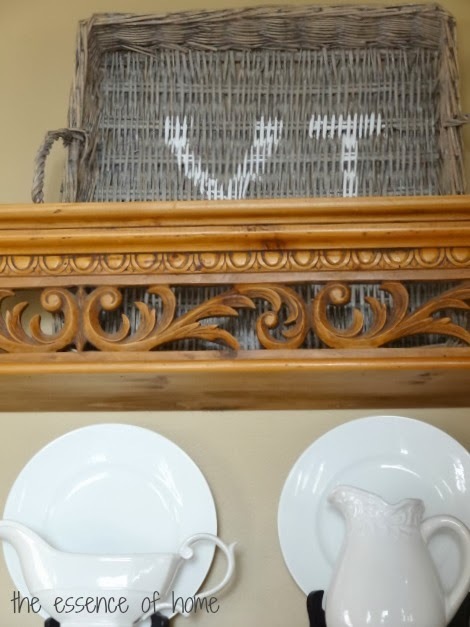 You have a beautiful collection of those wonderful weathered gray baskets and love where you display them! Love your baskets Kelly..I used to have that addiction until I moved and have no room for them anymore.. I am a basket person, for sure. You find the best stuff at Ikea. I was not so lucky when I went recently. Love the way you have used all of your wicker. I love that tall and skinny one! So many possibilities with baskets. I really need to get one to keep my magazines in. 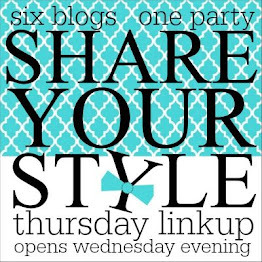 I saw that you're on Pinterest and Facebook...now maybe you'll get on Instagram too? :) I'm not on Pinterest or FB, but would love to follow you on IG. I love how easy it is to post a quick pic. I'm becoming addicted to IG. Lol! 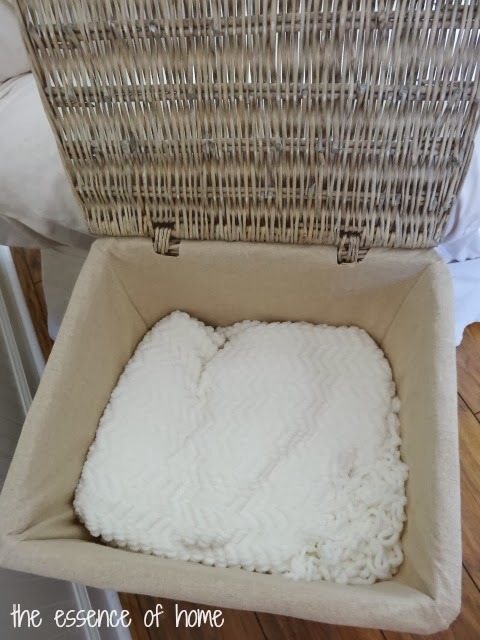 You have a beautiful basket collection Kelly.Love the hamper basket for extra blankets,what a creative idea!